If you want to put the doldrums of winter behind you, decorating your home for Valentine’s Day is a terrific way to start. When your home is decked out in shades of pink and red, there is a good chance you will start looking forward to the early days of spring. Wanting to festoon your surroundings with hearts and Happy Valentine’s Day is great, but how do you know where to start? If you want help getting your home ready for February 14th, here are a few seasonal decorating tips you can try. Not only are roses one of the top flower choices for sweethearts everywhere, they are also a sign of the impending freshness of spring. Add white vases with red artificial roses to your dining room table. Place rose-scented potpourri in a glass vase in your bathroom. You can even wrap artificial rose stems around one side of a circular wreath purchased from your local home decor store. Add your creation to the front door of your home and your visitors will instantly understand you are prepared for Valentine’s Day. If you are looking for a creative DIY idea for a Valentine’s Day party, consider making your own edible centerpieces with waffle cones. Place a series of glass vases in a row in the center of your table. Place a waffle cone in each glass vase. Fill the cones with tasty treats like chocolates wrapped in pretty foil, cinnamon hearts, candy necklaces, and pink, red, and white gumdrops. Your guests will be impressed with your creativity and your centerpiece will have been extremely easy to create. One way to add dramatic flair to your home decor for Valentine’s Day is to go all-in with a rich, dark red color theme. Cover your dining room table with a red tablecloth, add a white table runner, and then place red decorations throughout the room. Add white dishes, red napkins, and white napkin rings. Purchase red helium-filled balloons and place strategically around the room. This dramatic look is sure to impress all who enter your home. If you are feeling crafty, spray paint pine cones in pink and red and place them in glass vases or Mason jars. You can place your creations in groups of three around your home. Add your festive decorations to your mantle, in your kitchen window, or on the back of the toilet in your washroom. This DIY project is easy to complete and helps you clean your yard of autumn’s fallen pine cones at the same time. Add plenty of hand-cut paper hearts to your home decorating theme by getting your children involved in the decorating process (be sure to supervise). Spread pink, red, and white paper hearts on coffee tables for extra homespun appeal. If you’re looking for a rustic touch, display wooden hearts or string some of those paper hearts on twine to use like streamers. 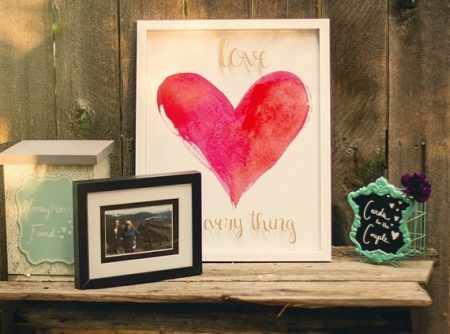 You could also create or buy some framed heart photos or paintings. These are just five of many ways you can decorate your home for Valentine’s Day this year. Be creative in your approach to decorating for February 14th and your thoughtfulness and ingenuity will not go unnoticed.